Spinal traction is a form of non-invasive spinal discs decompression therapy that relieves pressure on the spine. Nonsurgical spinal decompression can be performed manually or mechanically. Back stretching is used to treat ruptured or herniated intervertebral discs, sciatica, degenerative disc disease, pinched nerves, scoliosis and general back pain relief. If your spinal disc looks more like a herniated or ruptured disc, your body can potentially begin to heal through the process of resorption. But much better if you’ll help with it, applying some gentle spinal traction back pain therapy. It could be light manual massage, physiotherapy or spinal traction treatment with Detensor mat. If you are still dealing with persistent symptoms after several months of conservative back pain treatment and waiting for your disc to heal on its own, your doctor may provide more recommendations, but remember: spinal surgery is the last resort! Many methods of spinal traction treatment have been used for the lower back pain relief since the time of ancient doctor Hippocrates. Throughout the 50’s and 60’s years of 20th century it became widespread, and until today it is used by physiotherapists for threatening patients with low back pain and leg pain. 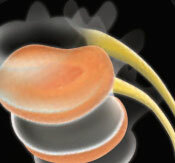 Even if its effectiveness is still being questioned by some doctors, there are three proven benefits defined in a lumbar spinal traction treatment: distraction to increase the intervertebral space, tensing of the posterior longitudinal vertebral ligament and suction to draw the disc protrusion towards the center of the joint. One of the non-surgical treatments for back pain relief is stretching of the spine, AKA spinal traction treatment, which can be performed manually or mechanically. It is a form of spinal decompression therapy used to treat backache caused by herniated discs, degenerative diseases, and nerve compression like sciatica. Spinal stretches relieves pressure from herniated discs and straightens the spine and provides consistent relief to patients. It does so by stretching tight spinal muscles and widening the intervertebral spaces to relieve nerve impingement. 1) Manual: Manual spinal stretching and vertebrae stretching means that the therapist uses his hands to apply force to the patient’s body. 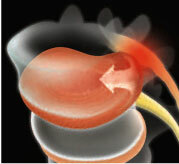 It is used to treat mild spine compression. It is a medically accepted form of therapy and is widely practiced by rehabilitative professionals. 2) Mechanical: Mechanical Lumbar Traction Back Pain Treatment makes use of a variety of tools to apply force to the vertebral column. Ropes, slings, and pulleys are some of the tools applied for this purpose. It may incorporate a special motorized self-traction table on which the patient lies. The stretching device, comprised of a head halter and a pulley system, will slowly stretch your spine, making the vertebrae move into their proper position. 3) Detensor: Spinal lumbar pain relief mat has a rib structure is manufactured from a material that has a unique ability to adapt to the contours of the body. Compressibility and point elasticity it such that reached the neutral position of the spine in position on the side, back or stomach, due to the fact that Detensor’s ribs as support points are always under the body lying, and the surface and the base are designed in strict accordance with the weight (mass) of the body. And since the power of stretching depends on the body weight, it is always individual for each person (patient or healthy). As a result of this important characteristic is prevented overstrain muscles and ligaments, and, consequently, the possible trauma, unlike applies other devices and systems for the stretches of the spine (“dry” stretching: Glisson loop tables with loops, underwater traction, etc). The basis of the therapeutic effect of any traction of the spine is a mechanism to reduce pressure internal-disk. This ensures that the removed disc Hernia protrusion due to its absorption and self- straighten drive. This reduces or completely stops the tension disc of the posterior longitudinal ligament, which relieves pain and allows you to achieve lasting remission. 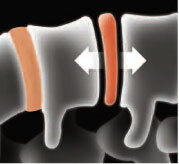 With spondylography proved the possibility of extension of certain PDS and increase capacity for intervertebral disc. Detensor system allows traction of the spine to treat back pain the gentlest way, exercising self-control, focusing on the patient’s body weight, and evenly distributing the force of traction, eliminating the excess load. Back stretching positively affects and with non-intestinal pathology, tk. affects the receptors of both fibrous and muscular tissues. The irritation of stretched muscular receptors causes the irrigation of the corresponding spinal centers, the restoration of their operability, especially after prolonged fatigue. The peripheral circulation improves by a reflex way, which normalizes metabolic processes and also contributes to the relief of pain. Stationary traction devices due to the cumbersome structure, their high cost and the risk of traumatizing the patient, have not received wide circulation. 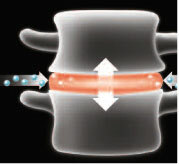 Devices for Detensor therapy are comfortable, portable and allow under any conditions to carry out sparing traction of the spine, restore the natural biorhythm of its physiological lengthening and normalize the metabolism of intervertebral discs, eliminate muscle spasm and pain syndromes. Most practitioners agree that contraindications to cervical or lumbar traction include, but may not be limited to, the following diagnosis: Spinal cord tumor, Ligamentous instability, Primary or metastatic tumor, Osteomyelitis, Discitis, Clinical signs of myelopathy, Severe anxiety. It can also be potentially dangerous in physical conditions like pregnancy, hernia, fracture, and cardiovascular disease and hence should be avoided. Especially some traction devices (inversion tables, traction tables) have many well known side-effects and lawsuit cases. Each treatment can last up to 30-50 minutes and a total of 20 or more treatments may be required over five to seven weeks. The therapist initially uses less force during the procedure and then gradually increases it according to the patient’s tolerance level. However, the extent and seriousness of the disease determine the number of sessions required. Spinal Decompression / Traction is an effective way to get relief from back pain without surgery. It has no long-term risks or potential side effects and results in adequate spinal alignment. It works as an enhancement for other therapies and is easy to administer. In addition to help with the lumbar pain, spinal mechanical traction therapy could improve general health conditions because of opening intra-discal spaces and increase oxygen and supplemental fluid flow into the spinal cord and spinal brain. Therapeutic spinal traction treatment is hundred-year-old concept. Many studies have been conducted to show its efficacy. Its goal is to relieve pain so that the patient becomes more functional. Many have benefitted from this therapy as it can enhance the healing process and render quick and amazing pain relief. For those who want to read more about spinal traction back pain therapy and other options for lower back pain treatment, please read next article.